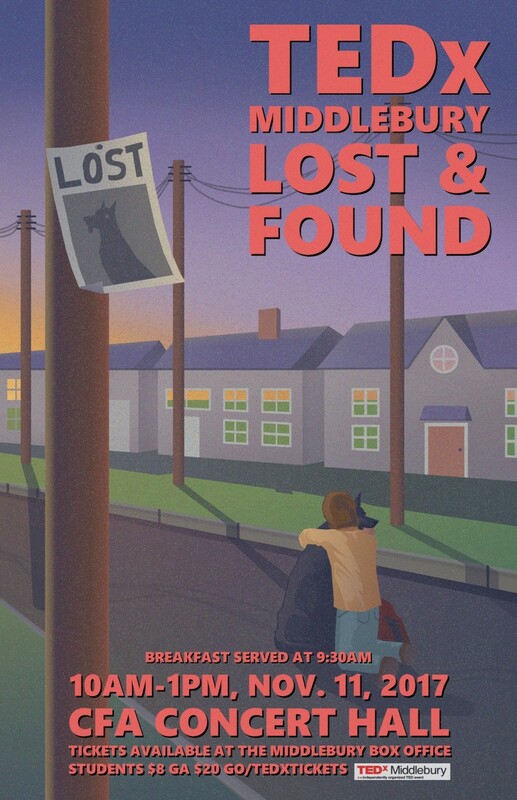 TEDxMiddlebury: Lost and Found will be held on Saturday, November 11th from 10:00am to 1:30pm at the Middlebury College Center for the Arts Robison Concert Hall. The theme, Lost and Found, is about the perpetual discovery and rediscovery that is essential to our existence as human beings. It questions what it means to feel lost and find purpose once again, be it in the formation of ourselves or the creation of our communities. This year’s speakers include the Southern Poverty Law Center’s Outreach Director, a Vermont-based design professional, a Kentucky state legislator, and a Spanish linguistics expert. Speakers will also include the winner of this year’s Student Speaker Competition, Nia Robinson ’19, as well as Middlebury alumna Rana Abdelhamid ’15. We hope that you will join us for a wonderful morning of TEDx talks and conversation. Tickets can be purchased from the box office in McCullough Student Center, in the Center for the Arts, or online here: https://tinyurl.com/y8s62db3. For more information on this years event and TEDxMiddlebury, please visit our website (http://sites.middlebury.edu/tedx/) or our Facebook page (https://www.facebook.com/TEDxMiddlebury/). For questions, please email tedxmiddlebury@middlebury.edu. This entry was posted in Midd Blogosphere and tagged Midd News & Events, Midd Points on November 13, 2017 by Lucy Scott.